​Sometimes your excavator or skid steer needs a little extra help from hydraulic attachments to be able to complete the job faster and safer. A variety of hydraulic attachments that were displayed at the recent TradieExpo in Perth can really make a difference in many applications. Daehan Rotating Multi Grapple DHRS that makes loading and sorting easy in a variety of applications was demonstrated at the Hitachi stand and it certainly attracted attention of many expo visitors. Another attachment that caught the eye of the expo audience was the SIMEX Twin Header Rock Grinder. With different cutter drum options and tools these rock grinders are effective rock grinding tools for the final trimming of concrete, rock trenching, face finishing of sheer rock walls, mining and tunnelling. 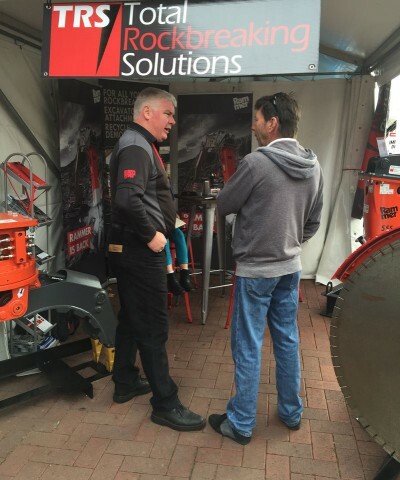 Reliable Rammer Rockbreakers in their red 'outfit' were widely recognised by the expo audience and GTS Diamond Rock Saw didn't go unnoticed with its sharp diamond blade. GTS Rock Saws are designed and manufactured in Australia can cut up to depth of 950mm without having to change multiple blades.